Laura Caramelli (see artist’s website) was born in Montelupo Fiorentino, a town on the outskirts of Florence famous for its production of artistic ceramics. She attended the atelier of Marco Lisa where she was intrigued by the use of metal putties and resumed modelling terracotta. It was at this time that she attended the school of ceramics in Montelupo Fiorentino, with a special focus on the use of the potter’s wheel. A short time later she met Roger Partridge who introduced her to sculpting in stone and marble both in atelier and at the quarries of Pietrasanta. For several years she worked with Frances Raynolds, the artist to whom she attributes her approach to minimalism and working with wood as a primitive material. In 1994 she held a one-man sculpture exhibition at the Ceramics Museum of Montelupo Fiorentino (FI) after which she joined the IBERNA group with whom she took part in the international art competition “Projet Uni Dufour”. The work was exhibited at the Musée d’Art et d’Histoire in Geneva. She also collaborated with Pietro Antonio Bernabei, the forerunner of European Bioart, with joint works and shows and subsequently with Primo Biagioni, a versatile sculptor in terms of expression and technique. In 2008, for the Olympic Games she was selected, along with 17 other Italian artists, to exhibit in the Forbidden City, at the ” Salon des Artistes Européens de Beijing “. Recently she joined the”Antica Compagnia del Paiolo” in Florence and has collaborated in the illustrations of Maria Rita Montagnani’s book: “Il grande ascoltatore”. Currently she divides her time between painting and sculpture; her works revealing a new stylistic dimension in which, while not abandoning her taste for substance, she has evolved towards a formal minimalism centred around the profound symbolism of man. Paola Caramelli was born in Montelupo Fiorentino, a town on the outskirts of Florence, famous for centuries for its craft and artistic activities, first and foremost, ceramics. She spent much of her childhood and adolescence in her mother’s atelier which mainly produced evening gowns. It was precisely in this atmosphere of sumptuous fabrics, colours and styles that her attraction for art and materials developed. After obtaining a degree in architecture she became involved in restoration where she was best able to express her passion for the search and balanced exploitation of materials. As an architect she carried out urban design in her town where she also set up various art exhibitions. Despite practicing architecture she still nurtured her love of art and as a result attended the professional school of ceramics in Montelupo for two years, later turning her hand to decorating porcelain under the guidance of a Maestro in Sesto Fiorentino. 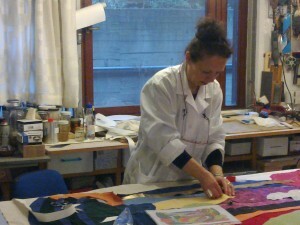 At the same time she also used various techniques to carry out fabric painting before beginning to create “minimalist” paintings, expressing her emotions through the recovery of materials. At the end of the war in the Balkans she spent two years in Mostar working as a coordinator of an international reconstruction project. 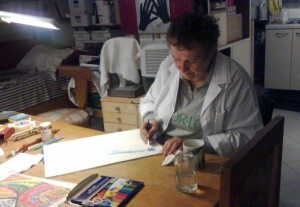 This experience had a permanent impression on her which was also projected onto her artwork and life in general. Over the last year she has worked together with her sister to create artistic decor structures, and once again she has given precedence to the study of shapes, materials and colours.